The discovery of high temperature superconductivity in copper-oxide-based ceramics (cuprates) in 1986 created tremendous excitement in the scientific community. For the first time superconductivity, the ability of a material to conduct electricity with zero energy loss to heat, was possible at temperatures an order of magnitude higher than what were previously thought possible. Thus began the dream of room temperature superconductivity, a dream that has been heavily sought but still unfulfilled to this day. The difficulty in creating a room temperature superconductor is that we still do not even understand how cuprate high temperature superconductors exactly work. We have known that the superconductivity is born from removing or adding a proper amount of electrons to an insulating antiferromagnet. What is more is that the material experiences a mysterious region, usually called pseudogap, when transiting from the insulating antiferromagnet into the superconductor. 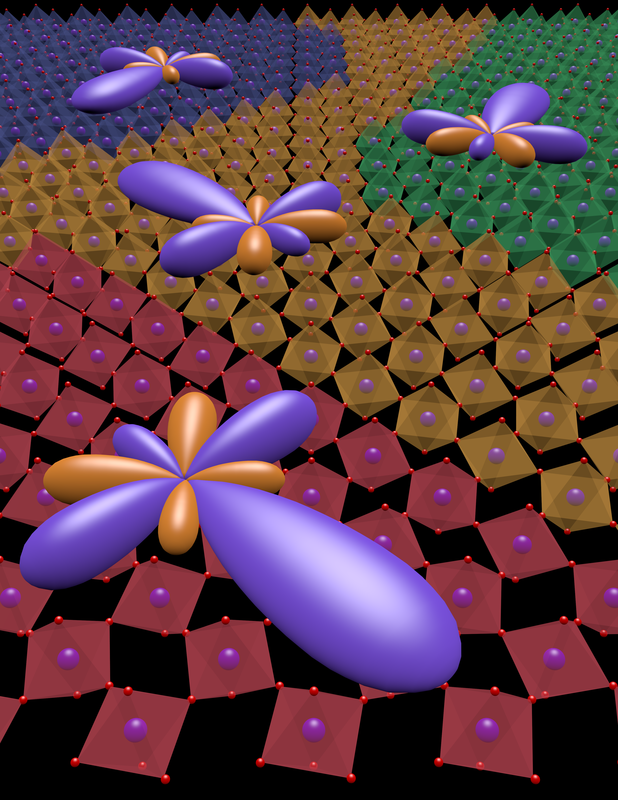 For decades, scientists have debated whether the pseudogap in cuprates is a continuous evolution into superconductivity or a competing phase of matter with distinct symmetry properties, and some believe that a better understanding of its nature and relationship to superconductivity can help to pave a path towards room temperature superconductivity. The compound that we are studying, strontium-iridium-oxide (Sr2IrO4), is a promising candidate for a new family of high temperature superconductors. Recent experimental findings in Sr2IrO4 reveal great similarities between Sr2IrO4 and cuprates. Sr2IrO4 is a novel insulator at room temperature and turns into an antiferromagnet below a critical temperature called Néel temperature (TN). With a certain amount of electrons added or removed by introducing foreign atoms in it, Sr2IrO4 enters into the pseudogap regime. 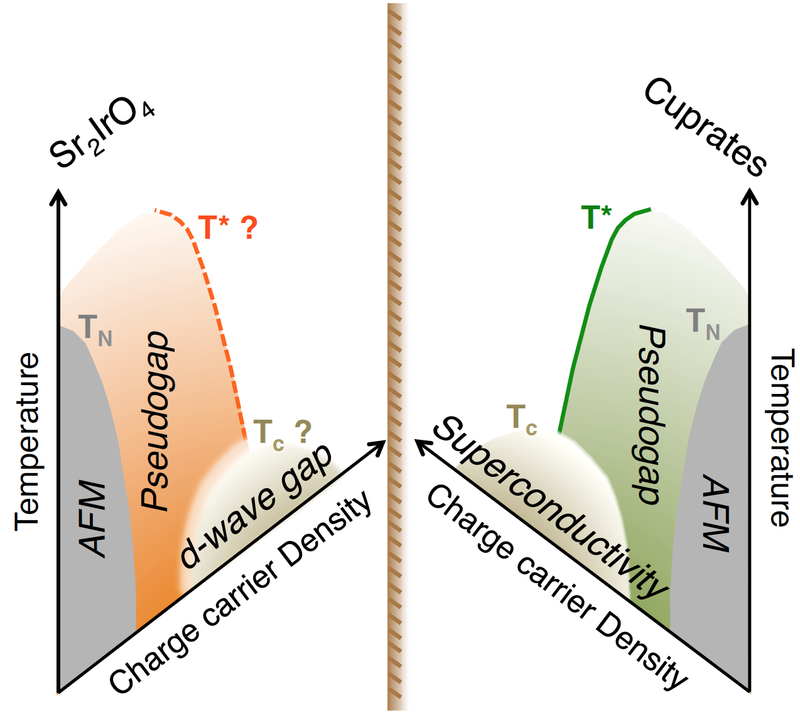 At an even higher charge carrier concentration and a lower temperature, Sr2IrO4 exhibits strong signatures of unconventional superconductivity. A summary of the evolution of Sr2IrO4 as functions of charge carrier density and temperature, usually referred as a phase diagram, is depicted into a cartoon below, which mimics that of cuprates. A cartoon showing similarities between Sr2IrO4 and cuprates. Our experimental results on the multipolar order in Sr2IrO4 further bridges the connection between Sr2IrO4 and cuprates. On one hand, there have been growing experimental evidences in recent years to support the presence of symmetry breaking phases of matter in the pseudogap regime of cuprates. On the other hand, the discovery of multipolar order in Sr2IrO4 where the psuedogap phenomenon has also been observed suggests a possible connection between these two. To establish the relationship between the multipolar order and the pseudogap in Sr2IrO4, one needs to compare the temperature scales at which each of them happens. So far, we have bounded a line in the Sr2IrO4 phase diagram for the multipolar ordered phase that breaks the 90o rotational symmetry from its high temperature state. However, the onset temperature for the pseudogap in Sr2IrO4 remains unknown in the community. 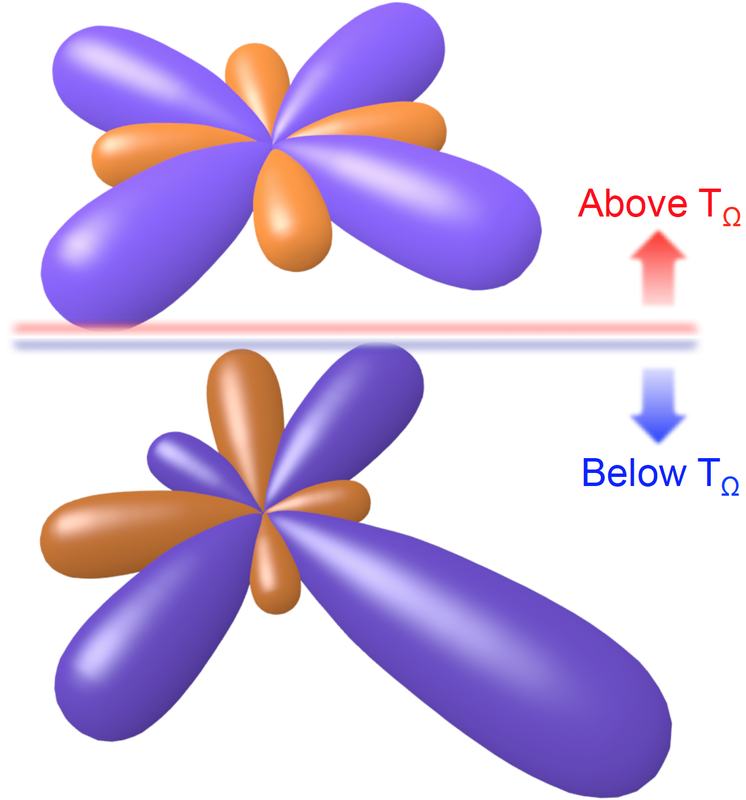 An artistic rendition of rotational anisotropy patterns both above and below the transition temperature T_Ω where the multipolar order happens, showing the 90^o rotational symmetry breaking across T_Ω. Retrospectively, the scientific story was told as above in which it seems our experiment perfectly fits in a void in the connections between Sr2IrO4 and cuprates. In reality, this experiment is my first encounter of serendipity in scientific researches. When we started our experiment, there were no experimental indications about pseudogap or superconductivity in Sr2IrO4, and we were just planning to refine its antiferromagnetic structure based upon its recently refined crystallographic structure. This joyful surprise makes me aware of the importance of sensitivity to unexpected results, especially in a developing field. Another surprise to me is the technique that we used in this study, namely rotational anisotropy optical second harmonic generation. This technique is as simple as shining light of frequency ω at the sample from a series of angles and collecting light of frequency 2ω reflected from the sample. The novelty of our setup is to move the light around the sample as opposed to the other way in the traditional version of this technique. Exactly thank to this seemingly trivial novelty, we are able to probe the multipolar order that is still challenging for other more sophisticated symmetry sensitive techniques. To me, it is this experience that is more valuable, and that is what I feel happiest to share. Although the dream of room temperature superconductivity is still unfulfilled, the cross comparisons between Sr2IrO4 and cuprates could be insightful in determining the important factors for superconductivity, and eventually make the journey towards the dream. Please find more details in our paper and Caltech media. Artist’s rendition of spatially segregated domains of multipolar order in the Sr2IrO4 crystal. This entry was posted in Experimental highlights by zhaoliuyan. Bookmark the permalink.